Houston’s long-term plan for improving bicycle routes around town will wait a couple more weeks after a handful of elected officials voiced various concerns. City Council members Greg Travis, Michael Kubosh, Steve Le, Mike Knox and Dave Martin tagged the proposed Houston Bike Plan on Wednesday morning, delaying its approval for at least two weeks. 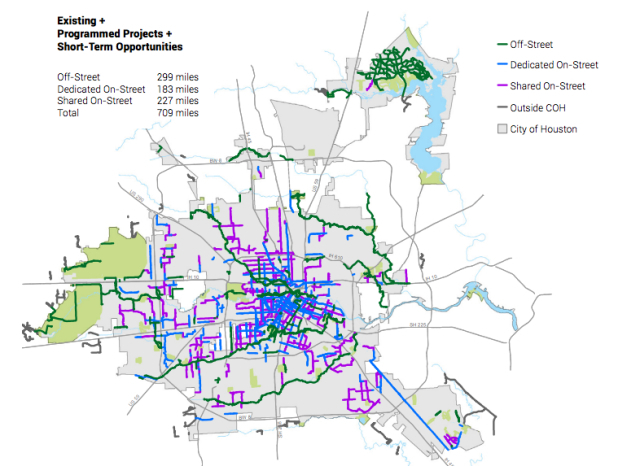 The plan, which doesn’t commit money but does guide future projects as the city proceeds with road work, lays out an ambitious plan for hundreds of miles of high-comfort bike lanes in Houston, meant to make bicycling safer and more appealing to residents. Work on the plan began roughly 18 months ago and has been through various drafts with input from city and community officials. See here for some background, and here for the plan itself. If you’d like a more executive-summary view of it, see this Offcite post from last year, and this Kinder Institute blog post from Wednesday. At some point, part of the solution for traffic has to be getting some cars off the road, and the best way to do that is to give more people more non-car options for their daily travels. Note that you don’t need someone to completely give up their car to have an effect here – trading in some of your car trips for non-car travel helps, too. Let’s get this done, y’all. The Chron editorial board agrees with me on this.